Taking a mere casual look at the landscape across the country regarding non-compete laws, you will see several states, such as New Jersey and Pennsylvania, with draft bills in the pipeline seeking to substantially curtail non-compete agreements (for additional information on those bills, see, e.g., "New Jersey Bill Proposes Strict Limits on Non-Competes," and "Is PA Going to Join the States Banning Non-Competes? "), or, as in the case of Massachusetts, where they have already signed such legislation into law. As a practical matter, in a very granular way, this presents challenges for businesses that don't tend to re-visit their employment agreements and restrictive covenants on any type of regular, organized basis. As we all know, this means the vast majority of businesses; it's just not on, or near, the top of the list of priorities for the business. On the one hand, technically speaking, this former employee is violating the letter of the agreement; on the other hand, the agreement wasn't updated to accord with changes in the law, which means that the agreement may be unenforceable as a matter of law. This is precisely the difficulty that the plaintiffs faced in Stamford Health Medical Group v. Anthony Alleva, M.D. et al., a case that was just filed this past October, wherein Stamford Health, a multi-specialty medical group, sought an order of the court barring four of its former doctors from competing against it. The problem was that these agreements, which had been signed several years before Connecticut's Physician Non-Compete Statute became law in 2016 (CGS §20-14p), were far broader in geographic scope and duration than allowed under the new law. In fact, it was this provision that the Court relied upon in finding, at least partially enforceable, the departing doctors' non-compete agreements in that case. 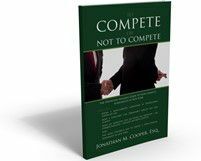 Insofar as non-competes are concerned, you should make sure to have a severability clause in your agreements. It doesn't cost anything extra, and it offers some extra protection for your legitimate business interests in case your agreement falls short of the mark on the law. Post a Comment to "Maybe the Most Important Clause in a Non-Compete Agreement"